As a mama, I’m passionate about making the best decisions for my son as he grows up. When my sisters and I went through our pregnancies, we talked all.the.time. about the best choices for our kids. There were so many variables and decisions and ideas. I spent hours upon hours researching how to make the best decisions for every possible situation I’d be presented with. In the middle of all these decisions and hours of research, was the overwhelming joy of anticipation. I couldn’t wait for my son, Nix, to be born. I excitedly anticipated the arrival of each of my nephews just the same. The journey of motherhood and being an aunt was one I couldn’t wait to go on! Now that all the boys are busy growing and being their own little people, I continue to be presented with decisions each day about life and parenting, as all parents do! As parents, we’re all trying to make the best choices in the moment with the knowledge that we have. My sister and I routinely chat about the best gadgets, the best apps, the best tips and tricks to raise our little adults to be the best they can be. One topic we’ve been focusing on more and more is how to keep our boys safe online. Over the years, it’s become increasingly inevitable that children will be spending time connecting and communicating online. I want the boys to have the opportunity to enjoy the best things the internet has to offer, but only in a safe environment. 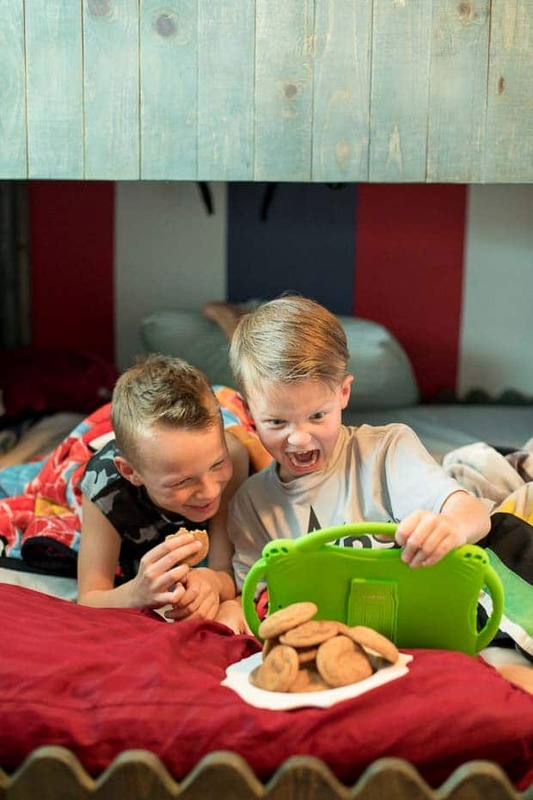 During a recent sleepover at my house, we downloaded a new app to the boys’ iPad — Messenger Kids. This amazing app allows the boys to be connected to family that is far away, all while staying safe. 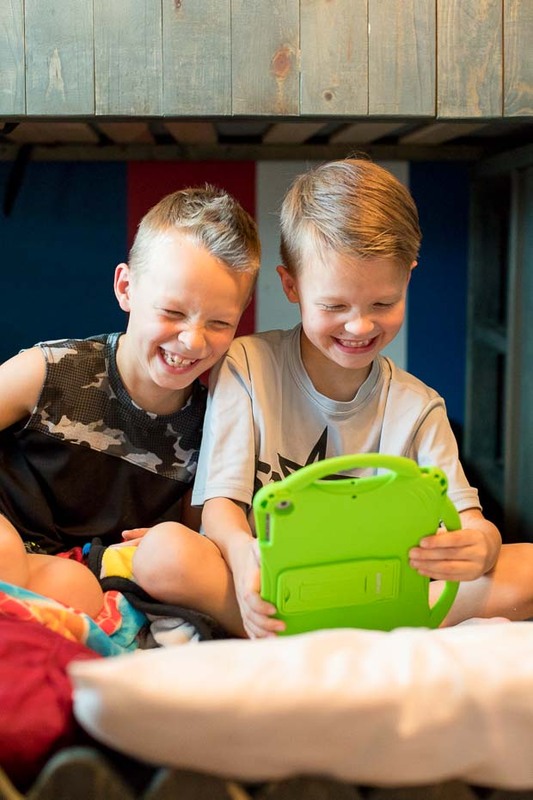 Messenger Kids is a free app that you can download from any of the app stores: Apple, Android, or Amazon Fire to use on their tablet or smartphone. 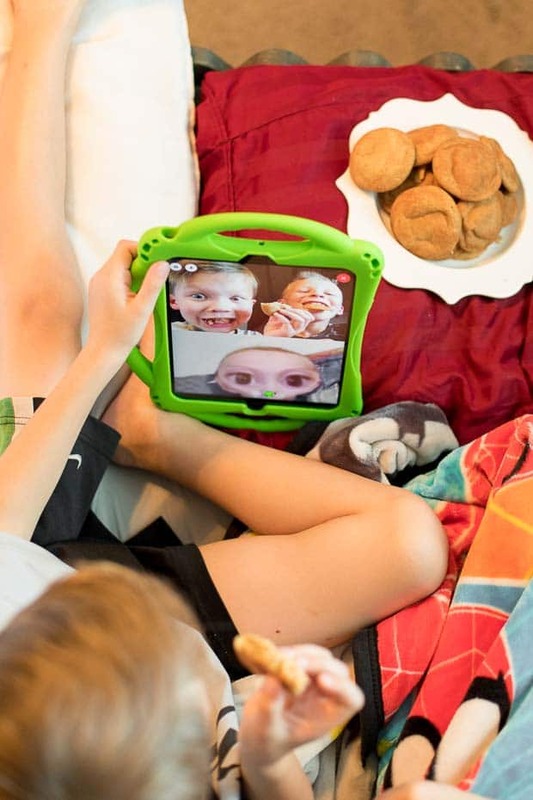 It’s amazing option for kids to be able to use video calling and messaging within a safe, controlled environment. 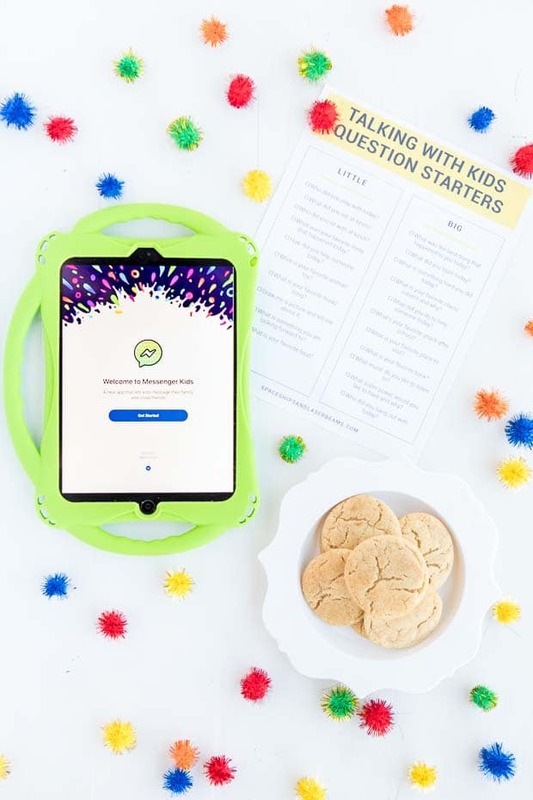 Setup is easy for parents, who can use their own Facebook Messenger account to create an account for their kid in the separate, safer Messenger Kids app. This is the best part –> kids can only connect with contacts you’ve approved. This gives me great peace of mind. Within the app, kids can make group or one-on-one calls all while using fun, interactive masks, reactions and sound effects. Getting started is easy. Once you download the app, set up is a breeze. You connect Messenger Kids through your own Facebook account. You’re able to access the parental controls at any time within your app. I love that messages can’t be hidden or deleted, so I can always see what’s going on. The app is also so much fun for kids to play with — it truly was designed with a kid’s point of view in mind. My sister and I always loved baking together, so I love that the tradition carries on with our kids. Recently, as we were mixing the batter for the snickerdoodle cookies they requested, the boys asked if they could video chat with relatives. I was happy to tell them yes — and then I had the pleasure of watching them be completely silly while they video chatted via Messenger Kids. Their faces and squeals of giggles say it all. Family time is the best time — and thanks to technology, it’s possible even around the globe. Warm snickerdoodles made it an even better experience. I’m going to share my recipe with you! Oh, friend. If you’ve never had a snickerdoodle, you’re missing out! In this amazing recipe, the cookies are rolled in cinnamon sugar before baking. The result is tasty, simple and perfect — and they smell awesome while baking! Make sure you nab the recipe below! The boys were happy to munch as they chatted online, and we were happy that they were on a platform that we had full control over! This delicious, classic cookie recipe is a snap to make and smells heavenly with the cinnamon sugar coating. Add the egg and vanilla, and beat on medium-high speed about 3 minutes. Roll the cookie dough balls in the cinnamon sugar mixture and set out 2″ apart on the baking sheet. These are the best snickerdoodle cookies I have eer had. So sweet with the best texture!